Farrar, Straus and Giroux, 9780374272340, 160pp. When can you photograph your food? What do you do when you’re running late? What can you eat with your hands? Are you the guest who runs late and texts real-time updates? The diner with allergies or the host trying to accommodate them? The social media addict who can’t put your phone down at the restaurant? 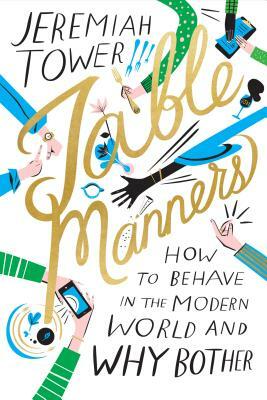 Whether your manners are a disaster or you simply need some fine-tuning, here is an authoritative and witty guide to table manners for everyone and every occasion. Jeremiah Tower is the forefather of California cuisine and the author of the James Beard Award–winning cookbook Jeremiah Tower’s New American Classics. He began his culinary career in 1972 as the co-owner and executive chef of Chez Panisse, and has opened numerous highly acclaimed restaurants in San Francisco and around the world. He is the subject of the documentary Jeremiah Tower: The Last Magnificent. He lives in Mexico. Libby VanderPloeg lives in Brooklyn, New York. Her work comes out of her deep affinity for storytelling, music, letterforms, printed ephemera, and wildlife. None of these works could have been made without the world's finest brioche and several good, strong cups of coffee. "Tower successfully narrates the dos and don'ts of entertaining for all partygoers and planners."